Marcelo Bielsa revealed his delight for goalkeeper Bailey Peacock-Farrell who emerged as the hero of Leeds United’s hard fought 1-0 victory over Reading at Elland Road. 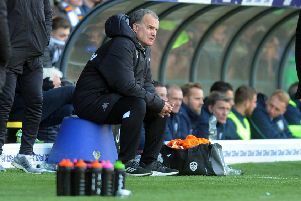 Peacock-Farrell missed his first league game of the season through injury last Saturday and Bielsa indicated beforehand that he would have been left out if Jamal Blackburn had not broken his leg. But if he was under pressure to perform against Reading it did not show as he kept a clean sheet thanks to a brilliant penalty save near the end of the Sky Bet Championship game. It looked like the Whites were about to throw away the lead given them by Stuart Dallas’s first goal for 14 months as Barry Douglas brought down Josh Sims in the 89th minute. But Peacock-Farrell came up with a top class save, diving to his right to keep out Marc McNulty’s well struck low spot kick. And Bielsa showed his appreciation of his goalkeeper when he said: “I’m very happy for him and I’m very happy for the team. “We had an intervention that resolved the game and he had a very big influence in the fact we didn’t lose two points. Bielsa felt Leeds had been good value for the narrow win. He added: “Our performance had ups and down,s but generally speaking we deserved to win. “We would have liked to have finished the game better, but we made three substitutions and we were built to attack and then the opponent dared to play more. Bielsa had sprung a surprise with his team, giving Lewis Baker a first league start for United and selecting him ahead of Samuel Saiz. He only lasted 45 minutes as he and the equally disappointing Ezgjan Alioski were both taken off with Saiz and exciting young prospect Jack Clarke coming on to greatly improve the attacking options. Leeds were a bit flat in the opening half as they had been in Saturday’s game against Bristol City, finding it hard to play through the midfield of Reading, who had the better of the play up to the break. But the Whites did have a great chance in the second minute when Barry Douglas was allowed a free header in the area after meeting Pablo Hernandez’s cross, but steered the ball wide. Reading’s first effort came from a free-kick when Leandro Bacuna tried to catch Peacock-Farrell out with a free-kick from wide out only for the keeper to tip the ball over. Yakou Meite was unable to convert a half-chance from the corner while at the other end Kemar Roofe’s volley was blocked and he sent a well struck angled shot from the edge of the box not far over. Danny Loader and Chris Gunter saw efforts blocked for the visitors and the half ended goalless with Leeds having Alioski booked near the end of it for a blatant dive as he looked to win a penalty. United’s attacking substitutions opened the game up more after the break and straight away Saiz and Clarke were in on the action, the pair combining well before the Spaniard saw his goalbound shot blocked. Within a minute Loader’s weak header was easily saved as he got free at the far post to a threatening Reading break. The Whites gradually began to turn the screw, however, with Hernandez being set up only to shoot horribly wide following good play by Saiz and Clarke and Roofe meeting Douglas’s superb cross only to see his header equally well saved by Anssi Jaakkola. Leeds went ahead just after the hour when Hernandez’s back heel put Douglas in space down the left and his cross was turned in by opposite full-back Dallas after Roofe had seen two efforts blocked at close range by the keeper. Loader had a half-chance to hit back for Reading, but his volley on the stretch was easily gathered by Peacock-Farrell. Hernandez scuffed a shot wide for the Whites and they came close to doubling their advantage as Clarke did well to get to the bye-line and supplied a good cross, but Roofe once again saw himself denied by Jaakola at point-blank range. The final action proved to be ultimately decisive as Reading’s swift break won them their penalty, but Peacock-Farrell proved the hero of the hour to ensure Leeds went back up to second place in the table ahead of their big clash with fourth-placed Sheffield United at Bramall Lane on Saturday. Leeds: Peacock-Farrell, Dallas, Phillips, Cooper, Douglas, Forshaw, Hernandez, Baker (Saiz 45), Klich (Shackleton 73), Alioski (Clarke 45), Roofe. Reading: Jaakkola, Yiadom, Ilori, Moore, Gunter, Kelly (McNulty 77), Bacuna, Ronomhota, Loader, Swift (McCleary 61), Meite (Sims 70).